Articles to help parents of young children find quality daycare in their area. Tip, tricks and questions to ask to ensure you find the best daycare. Childcare Expenses to parents who qualify? Every year the United States government and private foundations give away billions of dollars in free grants. Unfortunately, most people don’t know these programs exist. A free grant is free money from the federal government or a corporation that is given to people that could use the money to improve their lives. Each year over $10 billion is given away and every American is eligible. For the Year 2010 there are over 1,000 Federal Programs, 24,000 State Programs, 30,000 Private Foundations and 20,000 Scholarship Programs available. There are over 1500 Government Grant Programs administered by 57 different Federal Agencies! One of the biggest concerns of starting a daycare is the daycare license requirements. The myths and stories surrounding these requirements can be challenging for anyone. Just finding the rules is the first challenge, and then you find the rules written in some foreign lawyer speak. In the end it really doesn’t need to be that challenging. So here are 6 things you should know about daycare licensing requirements. You may not need to be licensed. Yep, let’s start with a big one. Depending on the number of kids you take care of and where you care for them you may not need to be licensed at all. 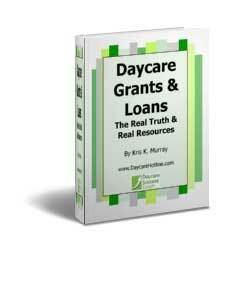 Generally speaking small home based daycares are free to operate without a license. Each State sets it own rules. States are the regulating authorities for daycares, often thru their health departments. Because of this rules and requirements change state by state. However, the rules tend to be similar. The main point is to make sure kids are taken care of just like you would like yours to be cared for. Licensed providers can charge more. Licensed providers are in greater demand, and can be paid by many state programs for child care. This allows them to charge more, and still be full, what a great combination. Not expensive to get licensed. You would think it would cost a lot to get licensed and be allowed to charge more, but you would be wrong. The biggest cost is the cost of time to complete the paperwork. Other than that the cost may be no more than a small filing fee. Don’t let the cost of becoming licensed hold you back from going forward. Finding the rules is easy. Because this is one of the most common questions when starting a daycare I have done a lot of the hard work for you. You can find the complete state by state listing of daycare license requirements here. You will find a brief overview of the rules along with links to all the specific rules. You should not be afraid of becoming licensed. It can be scary to start the licensing process, and doubts will start to fly around in your head. Don’t let this stop you. Remember the rules are only set for the basic safety of the kids you will be taking care of, and are nothing more than what you would want for your own child. If you are taking good care of children already and showing concern for their safety you have done what every state would want. In the end the choice is yours about whether to become licensed or not. But don’t let a lack of knowledge stop you from becoming a licensed daycare provider. Looking for Summer Time Care? Don’t Despair, the Possibilities Are Endless! Whether you’re seeking full or part-time care, either of these options could provide your children with a summer of fun. Many programs not only offer terrific activities on site, they also offer field trips and transportation to outside activities, such as trips to the zoo and swimming lessons. Teen Babysitting: Another option could be a part-time teenage babysitter (with a car) who can take your kids to the pool, the library, the playground, and other fun places. If you choose this option, be sure to hire a responsible teen with a clean driving record. Ask for references, then check them. The best resources for finding camps in your area, are more than likely your local Parks and Recreation, Athletic Clubs, Swimming Pools, Dance and Gymnastics Academies, Community Churches and Children’s Museums. By choosing a variety of camps and alternating them, your child can experience a well rounded summer by attending those that offer sports, arts and crafts or educational activities. If you’re looking to enrich your child’s summer with learning, you may want to check with your Community College, Parks and Recreation Department or Local School District. Typically a variety of courses are offered from all three resources on topics varying from acting and writing to foreign languages and math. Regardless of the type of care you choose, be prepared by having a back up plan in the event that the class, camp or center is closed or canceled due to lack of enrollment or already filled to capacity. How long has the business, organization, class or camp been established? Can you tour the facility prior to enrolling? Do the teachers, aides, coaches and providers have background checks? What are the child to adult ratios? How are illness or injuries handled? What safety precautions are taken regarding the arrival and departure of your child? With a little planning and thought, you and your child can experience a summer filled with fun activities. 1) The working relationship cannot affect your personal one, i.e. no favoritism and no hurt feelings should issues arise between you. 2) The rules, policies and pay dates for your daycare, apply to everyone-friend, family or otherwise and that they too must sign a contract agreeing to abide by these rules and policies established for your daycare. 3) Their children must also abide by your rules and be disciplined in the same manner as the other children. 4) If they cannot agree to the above, then you will not be able to provide care for their children. In a situation where you are already working with the friend or relative, I suggest that you provide them with a written contract and ask them to sign it. Although late, it’s better than not having one and this allows you time to cover your policies and possibly correct any misunderstandings regarding your daycare policies that person may have. If you have a signed contract with your friends or family members, enforce those rules just as if they were any other daycare family. On the first day of care for any child, regardless of who they belong to, make the rules of your home daycare perfectly clear. If the children do not listen, or follow the rules then apply the appropriate discipline. It is imperative that you be consistent and follow through after every warning. Providing quality childcare is a team effort, one that involves everyone, encourage teamwork from the beginning of care, no matter whose children you are caring for. If the above contacts are not able to assist you, contact the Licensing Agency in your State or your local Resource and Referral Agency. You can find your local Child Care Resource & Referral agency (CCR&R) by going to www.childcareaware.org. Keep in mind that just because a Provider is licensed, registered or certified, does not mean they are Quality Caregivers. It’s up to you as a parent to seek out the appropriate provider that offers the type of quality care you are seeking. What type of environment do you want for your children? How many other children do you want in your child’s group? Do you want your child in a mixed age group of children or in a group of children their own age? Is home daycare or center based care the best option for your child? What activities do you want available to your child on a daily basis? How much of a commute time do you want between your child care giver and your place of employment? What rules and policies would you like to see a provider offer regarding illness, discipline and safety? What type of experience or training would you like a provider to have? If the provider is new to the industry, ask for personal and past employer references. Create a list of questions to ask the references, regarding the character and demeanor of the provider. New research is suggesting babies learn to talk by watching how people speak and form words, and not just from hearing sounds. Florida scientists have discovered that starting around six months of age babies begin to shift their attention away from eye gaze and start to study peoples mouths when they talk to them. It does not take them long to absorb the information. . Generally one year of age babies start begin returning their attention to the eyes. However if they hear an unusual sound, like from a foreign language, they will return their attention to the lips in order to learn how to make the sound. So what does all this mean. Really it is just more support showing parents need to spend quality time with their babies, talking to them and reading to them. This is far more important than just giving babies something to do, or watching the TV. By taking the time and reading to babies so they can hear the words and see you speak, or just talking to them you can help your child learn to speak better and quicker. When looking for a child care for your child you should also take this need into account when reviewing programs. Be looking for child care providers who read to babies, and that have a ratio low enough to allow them to talk to each child several times during the day. It looks like learning to speak is even more complex than we had ever thought. 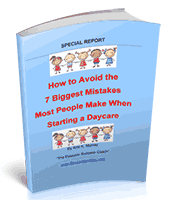 One of the biggest concerns of starting a daycare is the daycare license requirements. The myths and stories surrounding these requirements can be challenging for anyone. Provider Licensing/Registration: For your child’s safety, choose a caregiver that is registered with your State Childcare Licensing Agency. This ensures that the caregiver has met the State’s requirements and a satisfactory background check has been completed. It is strongly recommended that you contact the state and ask if any complaints have been filed against any caregiver you are considering. Location: The distance between your child’s caregiver and your place of employment can affect your daily routine in addition to playing a vital role in the event your child is injured, becomes ill or an emergency arises while your child is in the providers care. Choosing a program that is of equal distance between your home and work can reduce your commute time and will allow you the option of visiting your child should you choose. Safety: Every childcare setting should be properly childproofed with the appropriate safety precautions in place in the event of an emergency. Emergency Evacuation plans should be posted for Fire and Natural Disasters. The childproofing should be age appropriate for all the children within the providers care. Environment: A quality childcare environment should offer: age appropriate toys & activities; space for resting, designated areas for eating, potty training and diapering, quiet & messy play; and access to safe outdoor play areas that allow development of gross motor skills. The interior play areas should provide activities that meet the needs of all the children in the group. Growth and Development: Programs that care for a large number of children with too much activity and noise can affect your child’s growth and development by over stimulating them. Infants and toddlers can be greatly affected by their surroundings, especially those who are being introduced to a childcare setting for the first time. As you tour a caregiver’s home or center, ask yourself: Will my child thrive in this program? Are the activities and surroundings consistent with a nurturing atmosphere? Do the children currently enrolled appear to be happy? Does the program offer what you believe your child needs to grow and develop into a happy well adjusted child? Group Size and Age Span: Each childcare program offers a different age range and number of children within their setting. To determine the appropriate group size for your child, ask yourself how many children you want your child exposed to each day. Will the caregiver be able to provide quality care for all the children in the program? What age span of children do you want your child interacting with on a daily basis? Finding a program that places your child in the middle of the age group can offer an excellent balance, allowing them to learn from the older children and teaching them how to interact with younger children. Communication and Shared Philosophies: The caregiver should be easily approachable and have the ability to address any concerns regarding your child’s development and well-being. The provider should also be able to effectively communicate with your child. Consider the parenting philosophies that are most important to you and compare them to those advocated by the caregiver. Finding a childcare program that offers similar philosophies will provide both stability and consistency in your child’s life. Interviews and Visits: The childcare program you select must meet the needs of both you and your child. Your first course of action should be to interview the caregiver by phone. If you feel that the program meets your requirements, schedule a face to face interview within hours of operation. The first appointment should be without your child, so you can focus on what the program has to offer. Should you feel the program is acceptable, set up a second visit with your child. Do not hesitate to ask questions. Request a list of references for both currently and previously enrolled children. Written Policies & Procedures: Every caregiver should offer written policies and procedures regarding the operation of their program. Request a copy of the caregivers policies, including a written contract listing hours of operation, rates, rules, policies, pay dates, and closures. It is very important to have a clear understanding of the policies and procedures to ensure that coincide with your schedule. To prevent misunderstandings once your child is in the providers care, ask any questions you may have, before you sign any agreements or authorization forms. Use your instincts: Only you can determine the best setting for your child. If something doesn’t feel right or you have any doubts, then your child does not belong with that caregiver. It will take time, research, and patience to find the provider you feel offers the best program for your child.